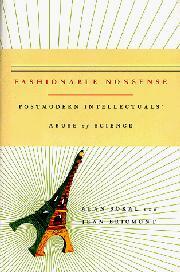 This latest volley in the ugly squabble between scientists and literary intellectuals was a sensation in France. This book began when Sokal, a professor of physics at New York University, sent a paper to Social Text, a leading journal of cultural studies. Ostensibly arguing that the theory of quantum gravitation supported postmodern critiques of science, the article was accepted and published. Sokal then, to great media fanfare, revealed it to be a hoax, assembled from scraps of academic jargon spiced with a few nonsensical references to math and physics. The editors of Social Text, eager to find support for their own ideas, had swallowed the parody without realizing that it made no sense. Now Belgian physicist Bricmont joins Sokal in a broader examination of how postmodern critics appropriate the language of science with an eye to discrediting it. This book dissects texts from the likes of Jacques Lacan, Julia Kristeva, and Bruno Latour, showing how they have taken scientific concepts out of context, often using them as nearly meaningless tokens to impress an audience that cannot judge the validity of their arguments. Attempts to apply relativity theory to social issues have been around for decades, but in fact all make the same elementary error: forgetting that Einstein was describing not human society but the physical universe. The authors also take issue with “epistemic relativism”—the contention that science is one of many “ways of knowing,” with no particular claim to objective truth. This edition closely follows the French original but has been expanded to refer more fully to American writers and philosophers. An appendix reprints Sokal’s Social Text article, along with a commentary and some afterthoughts. While some of the issues here will seem esoteric to most American readers, this is a valuable and well-argued document in one of the key philosophical debates of our time.